a decent western with good action, but just not enough of it, as the movie tries to be about character and gets too slow as a result. 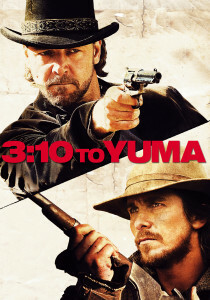 3:10 To Yuma is a james mangold directed film. nobody goes genre hopping as much as mangold does. from his breakout movie copland, about cops on the street, to his psychological institutionalized women movie girl interrupted, this guy proved early on, with movies like those, that he was different. Mangold is most comfortable when he is doing something new. just look at identity, his murder mystery in the rain movie, or walk the line, his biopic about johny cash. but with 3:10 To Yuma he tries to do what is nearly impossible. he tries to bring the western back to life. it’s unfortunate that he isn’t more successful with his attempt. 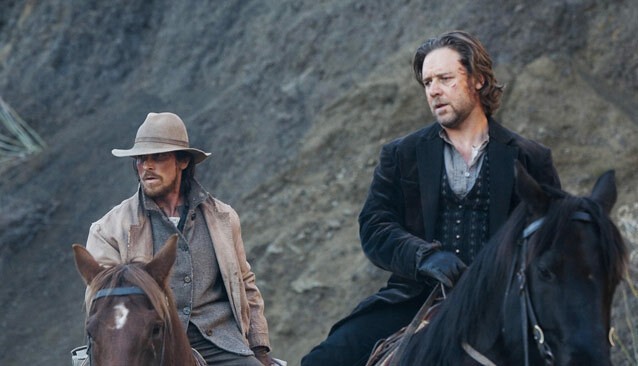 the movie is a christian bale-russell crowe vehicle, two foreign actors playing classic western americans. that’s fine, considering how well both actors pull off american accents, but the problems aren’t with the actors. they’re with the story. a good western is primarily an action picture set in the west. if the action is good and plentiful then the movie tends to be good. plot comes secondary to that. 3:10 To Yuma wants to focus on plot and characters more than anything else, and ends up lacking in the action department. the plot for this movie involves a prisoner being transported to the train that will take him to prison. that’s the mission of the movie, to get the prisoner to the train. it is a little too simple and straight forward and so mangold wisely does not get into the mission until a solid portion of the film has gone by. when the movie opens, we are with farmer dan evans (bale) and his family as local ranchers who work for a big time businessman come by and burn down dan’s barn. he owes money to the businessman and hasn’t paid up and the men threaten to give him only one week more before they come and burn down his house. Wade and his outfit of degenerate men, such as his second in command, charlie prince (ben foster), overtake a carriage that comes accompanied by bounty hunters hired to protect the loot on the carriage as well as a gatling gun that just fires away. none of it matter to the wade crew. they easily manipulate the situation and wade watches most of it from the distance before driving a herd of cattle in front of the carriage to stop it for good. the carriage attack counts as an action scene, but unfortunately it’s the last one we get for a while. wade and his crew come to town where wade settles in with a local bartender and beds her at the saloon. dan evans comes to the saloon as well, looking for the man who owns it and also owns his land. evans and wade come face to face just as men storm in to catch wade and take him away. this whole situation has problems in it. how did the men know that wade was there, at the saloon? And evans just happens to be there by coincidence, looking for the businessman at the time wade is being captured? The timing makes it feel like wade is somehow being captured because of evans, as if evans’ being there gave wade away to the authorities, but that doesn’t make any sense at all. either way, wade is captured (where is his crew and why aren’t they trying to help him? this would be a great moment for an action scene, a shootout in the saloon, with other men popping out of doors upstairs where they were also in bed with prostitutes.) I guess the reason for not having that happen is because the men need to be alive for the rest of the movie so that they can come back at the end to try to set their man free, but there are always ways, and an opportunity for an action scene in a movie that needs them badly should never be sacrificed. it could be as simple as that these men do all get captured, but charlie prince escapes and slips out the back door and goes to the next town to put a new crew together and bring them out to help his old crew escape. of course, none of that happens. instead, we just get dan evans volunteering to help take wade in along with a group of about three other men. and now the long and tiring journey begins. it will include multiple scenes just sitting around fires at night having conversations. and it will involve a lot of waiting and knowing something is going to happen later on. that’s not much fun. i understand that it’s meant to be similar to the plot line of the classic western movie high noon, where gary cooper spent most of the movie waiting around in the town, knowing that the outlaw who he put in prison was let free and was now going to be coming after him, but waiting is not fun. maybe if the character is spending the movie planning, going from person to person, looking for help, like in high noon, but overall we want to see action, not have to wait for it. walk the line isn’t meant to be an action picture. it’s meant to be a character study. there’s a clear relationship and even friendship between evans and wade here and that’s the fundamental backbone of the movie. these two have a like and admiration of each other. it really comes out by the end of the film. and then there’s also all of the symbolic and not so symbolic relationship situations between fathers and sons. the up front version is evans and his son, who disrespects his father, considers him a coward, and wants nothing to do with him at the start of the film. the symbolic version is ben wade and his “son,” charlie prince. just that last name “prince,” is meant to tell us exactly who this guy is. the second in command, the second to the king, and the son of the king. the movie does have occasional moments of excitement sprinkled in here and there, such as when wade kills one of the men by a fire or when the group encounters a bunch of chinese slave owners working on the railroad and gets into a fight with them. but these moments are quick and brief and there’s a lot of waiting in between them. we do get the action we were hoping for by the end, but at that point it’s not really enough. there is a twist ending, which is conversation worthy and interesting to think about, but it’s the only part of the movie that really delivers. for the most part this movie is artistic and looks great, but it is just too slow and not filled with the levels of action and excitement that it needed.